The Future Bookshop exhibition is in the studio space at NGV. The sound of school groups bounces off the high ceiling and stone tiled, as it’s connected to the NGV foyer where they gather to collect chairs and debrief before moving on to the next cultural experience. The Future Bookshop is amazing. When you walk in the door (just inside the atrium) there are two big armchairs to your left, with a bookshelf containing a bunch of interesting things to read. Right in front of the door is a wall, plastered with more QR codes than you’ve ever seen together in one place, all of which link to a different article/podcast/video/collection of thoughts about the future of writing and reading. There are also big copies of articles from The Emerging Writer, the EWF publication, which talk about interwebz and writingz. In the middle of this QR code wall is a panel with USB sticks poking out of it. Hook whatever USB-friendly device you’ve got up to these and download free ebooks, as well as loving words from the artists’ collective behind the USB installation. Next to this is an “ideas wall”, and under this is a table with paper and pens. You’re invited to participate by sharing your ideas about the future of books and writing and putting them up on the wall. In the middle of the room is a table, where you can sit down and join the writers in residence as they create. Of course, not all writers in residence make use of the table. I ditched it pretty quickly in favour of a beanbag (see below – photo via @lisadempster), and another writer is currently kicking back in one of the armchairs. 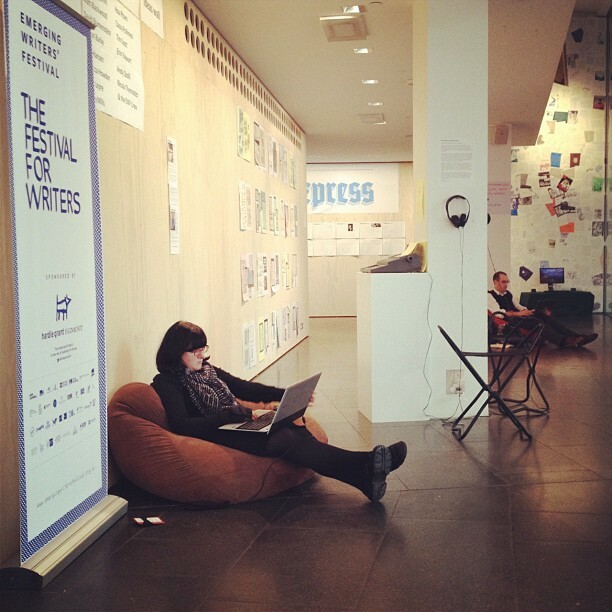 May I say – ALL writing places should have beanbags. It might just be an exhaustion hangover from the Festival, but the ability to sit equal parts vertical and horizontal in a squishy surface is really relaxing me and making the creative juices flow more easily. Another section of the front wall houses works-in-progress from the writers in residence. Up there so far: Tully Hansen‘s room-plan (see below), blog posts from Sophie Benjamin, and Julien Leyre had stuck something up right before I left. In the middle of the room also is a pole intended for structural integrity, which the Future Bookshop makes use of. There are headphones hooked up to looping podcasts, which visitors can sit down and listen to. Not just any podcasts, but Paper Radio podcasts – these guys podcast stories, with really nice sound things happening in the background. Next to the residents’ work-wall is a wall with book designs, and an interesting statement about the weirdness of books being super-accessible with free content around, but also becoming really expensive moving forward as they become obsolete. The back wall has copies off all the Signal Express, the EWF/Signal Express daily newspaper from during the festival. They did an amazing job, pumping out two articles and Twitter highlights every day throughout the festival. Tucked around the corner is a screen with looping vlogs with thoughts about the future of bookshops, books, reading and writing. Along the glass wall that faces the atrium are lots of lamps, all switched on. The future looks bright. But we don’t want to make light of the future either. They’re just lightening the atmosphere. We’re trying to shed some light on where we’re headed. Hopefully people are smart in the future too, and just as switched on. Puns finished. So that’s the space. 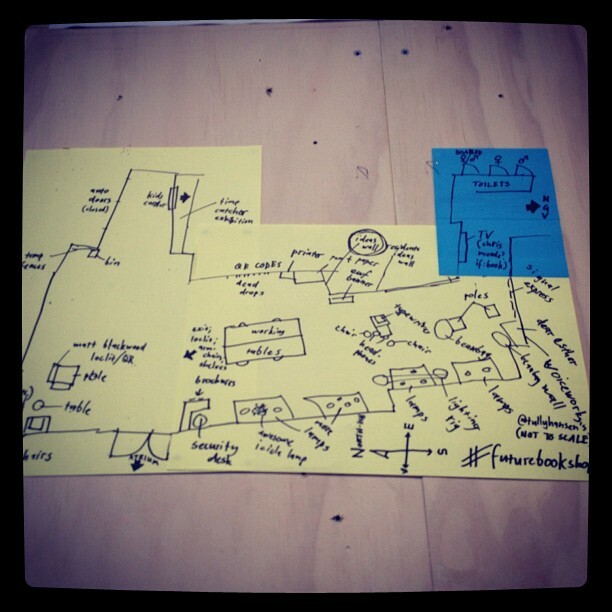 Check out Tully Hansen’s floor-plan (relevant to his very cool work – photo via @lisadempster) to help you envisage it. Even better, come down and visit to get a REAL idea of what’s happening. During my time at the NGV studio, I’ll be blogging. I’ll be doing posts about the future of the book, and what it means to be writing and reading in the digital age. I’ll also be drafting blog posts for after the residency, and saving up a little back-log of stuff. Talking with Angela Meyer last week reinforced that this is something I should do continuously – if I’d had more posts/drafts on hand during the end of semester, I wouldn’t have gone silent when my workload grew. And so that’s what I’m doing at NGV. Making Little Girl With a Big Pen happen. One fellow writing resident, Julien Leyre (who was one of the amazing writers who crossed that 30K mark at the Rabbit Hole!) is spending his time here translating a blog into French and Chinese. So maybe the future of books and writing is a place where things are more accessible. The thing I love most about working in digital spaces is the way that readers are able to feed back. The ways that readers become creators. This is reflected really well in Future Bookshop, and that’s what excites me most about the space. The audience is also the creator, those who are watching feed back into the space, and by having people in the space it becomes something else. It’s evolving. That’s what the future of the book is all about. I know! It’s so cool down there, really chilled space to write in and be creative with other creative people. See you down there! Ah, so you can come join you guys down there without being a writer in residence? I love beanbags. I have a few in our lounge room and am now tempted to make use of them. I’m tempted to plan out and draft blog posts too. I got a lot out of that discussion and some reminders in the masterclass too. Yeah Ben, there’s plenty of space to sit down and write. Might as well make use of it!